The Boeing C-17 Globemaster III is a military transport aircraft that features a fully integrated cockpit and advanced cargo system that can accommodate a crew of three. Exceeding US Air Force design specifications, this military transport aircraft is not only built to last, but also to impress. Aside from being able to take off using rough forward fields, it had the capability to be refueled during flight, allowing for much longer trips on a variety of missions. The Globemaster III can also carry out theater airlift and airdrop missions when necessary. It takes after its similarly capable predecessors, the C-124 Globemaster II and the C-74 Globemaster, which were both heavy lifter aircrafts. The Globemaster III received the esteemed Collier Trophy in 1995 for its unsurpassed aeronautical achievements. If you’re looking for a tough T-tailed aircraft, then the Boeing C-17 Globemaster III is the model aircraft for you. Featuring a rear loading ramp, international range, and the ability to land on the smallest of airfields, the Globemaster III can carry combat equipment or humanitarian aid anywhere across the globe, even to the most remote areas that do not have the luxury of a full airport runway. 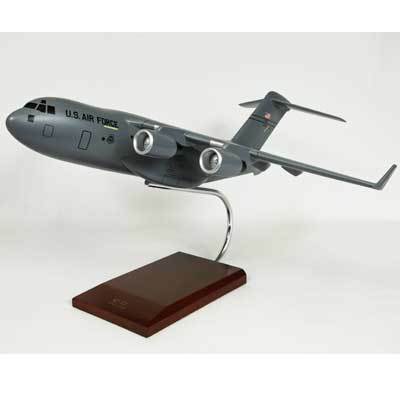 Now you can take this transport aircraft home as a model aircraft you can display in your home or office.